Below, oldest picture taken from first Church of St. Anthony founded in 1857. 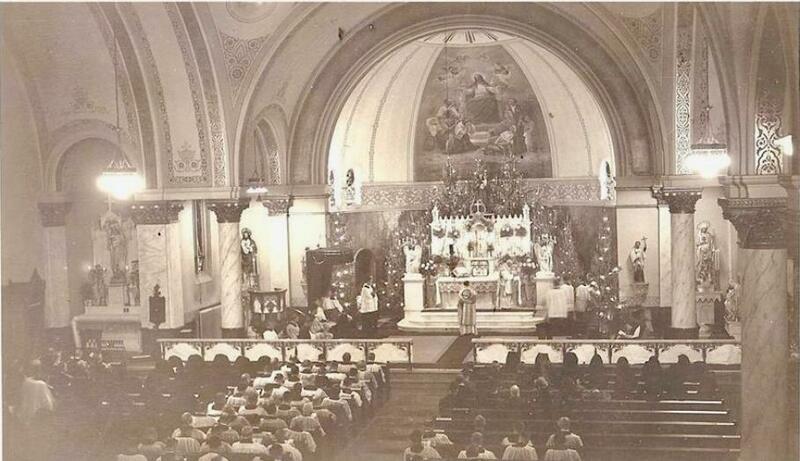 An old photo of St. Anthony's interior in the Christmas Season around the 1930s. The growing congregation of St. Anthony needed a larger Church. It was a new beginning in 1901, including a new Rectory, it was later expanded and is now the Franciscan Cathedral Abbey. Corner Stone of second church building and current Cathedral was laid: Anno Domini, In the Year of the Lord and the Jubilee on July 18th, in 1901.
and some historic pictures of the school classes and sports teams. As the school enrollments grow, the construction of a new and large High school became necessary. 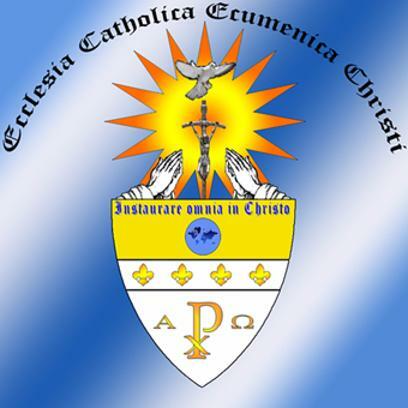 "In Memory of St. Anthony/East Catholic High School"
A historical Journey that lives on! 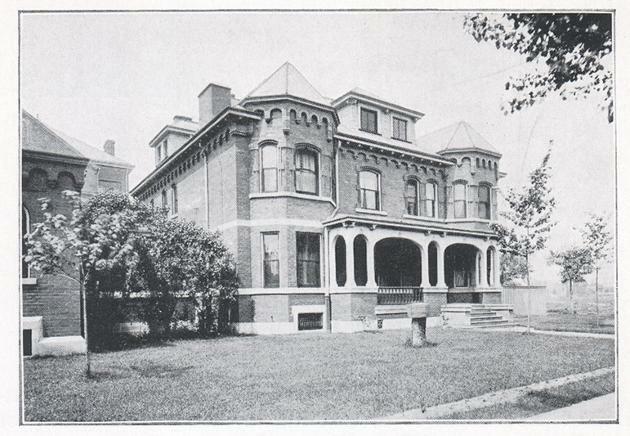 Beginning in the 1840’s, large numbers of Germans immigrated and settled on the rural east side of Detroit. 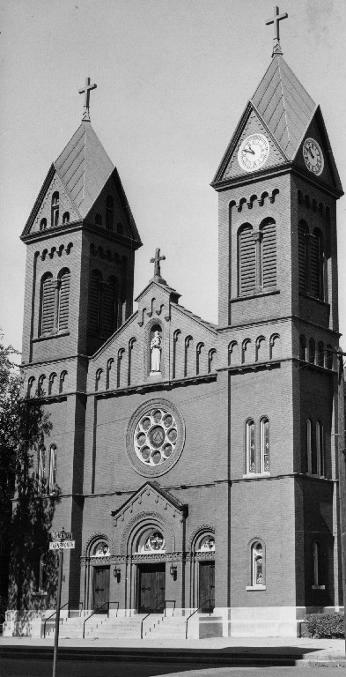 To serve the mostly Catholic population, St. Joseph Church was founded in 1855 near downtown, and quickly established a “mission,” or satellite church further up on Gratiot in 1857. 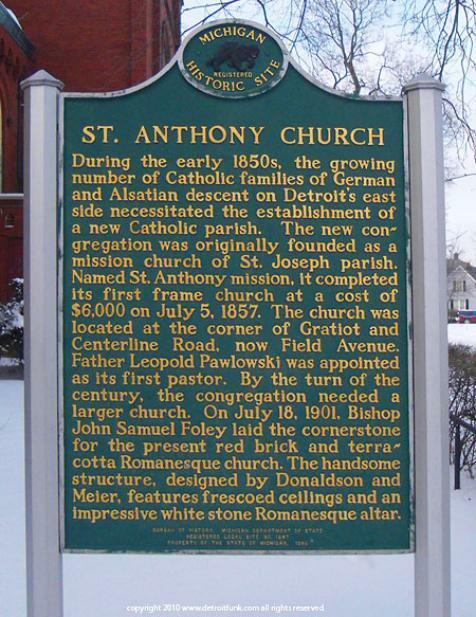 The wood frame church at the corner of Gratiot and Field was known as St. Anthony Mission. It was described as a “modest little church, once idyllically hidden and shaded by tower maples and pines… At the time of building the first frame church, there lived in that area, largely covered with primeval forest, about fifty families of German extraction…” The mission became a separate Parish church itself, adding a school in 1865, and a rectory house in 1868. In 1895, Reverend Charles Hutter was appointed pastor of St. Anthony, and started an ambitious expansion plan to meet the needs of the growing congregation. 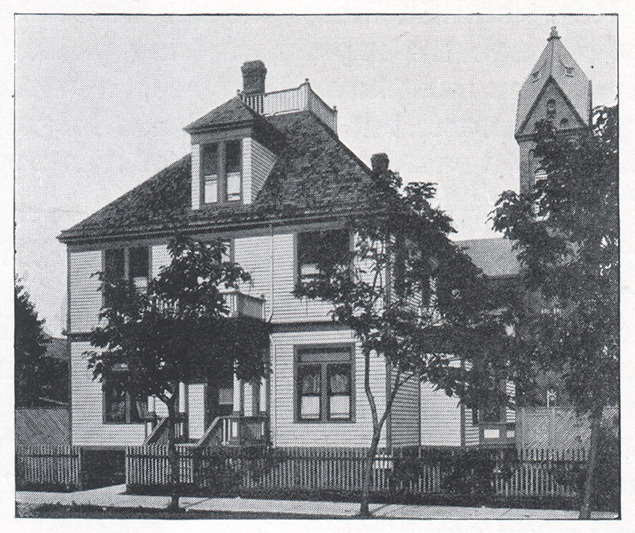 To attract more parishioners (and funds with which to build a new church), a new grade school was built in 1896. 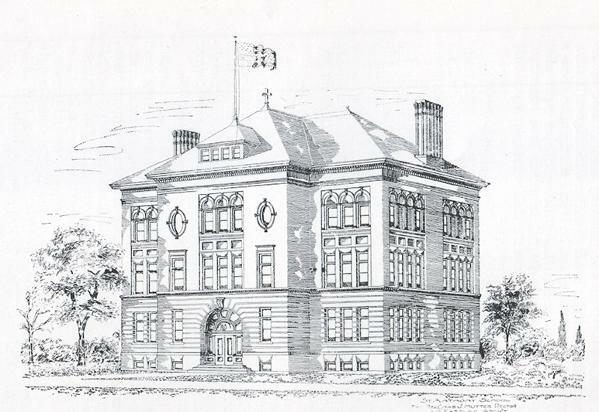 The plan worked; drawn to the high-quality education German offered by the Sisters of Notre Dame, parents began sending their children to St. Anthony School and became members of the church. The wood frame church was no longer adequate to hold the number of Sunday worshipers, and so in 1901 the cornerstone for a new, larger church was laid at the corner of Sheridan and Farnsworth Streets. Designed by Donaldson and Meier, the new Romanesque church featured twin spires of terracotta and red brick, one of which had a tower clock. The stained glass windows were some of the finest found in the city at that time; they were specially made for St. Anthony in Innsbruck, Austria and shipped to the United States. 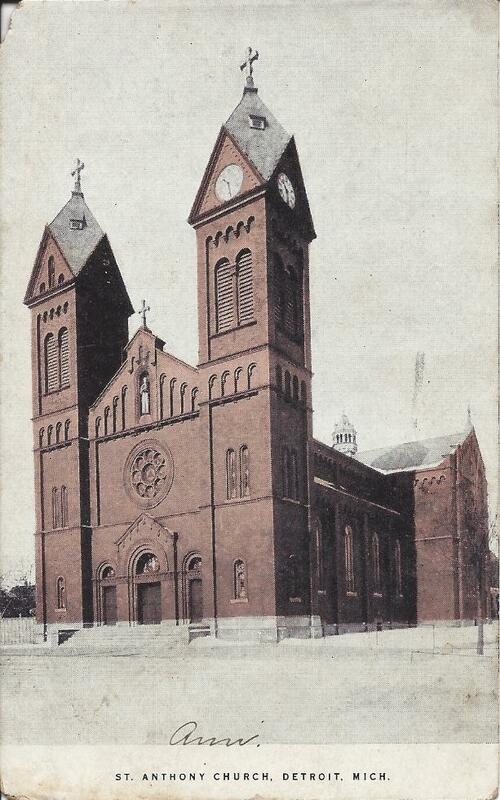 Construction was completed in 1902, and the church was dedicated in a ceremony on October 12th. The growth of the church outpaced even the most optimistic estimate, eventually peaking at 2,800 families. 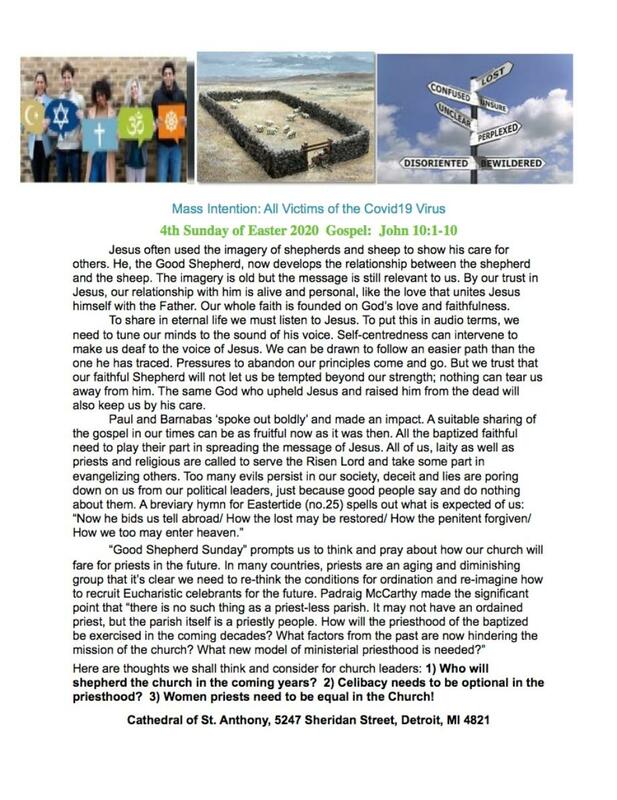 On Sunday alone, eight separate mass services had to be held, and all were frequently at capacity. But the church still managed to retain its close-knit family structure, with Father Hutter visiting members at their homes often. 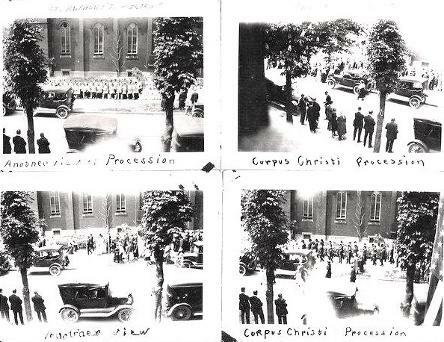 Though the war brought a halt to German immigration to Detroit temporarily, the church and its schools continued to grow. The grade school was added onto again in 1906, with construction on a small high school starting in 1918. 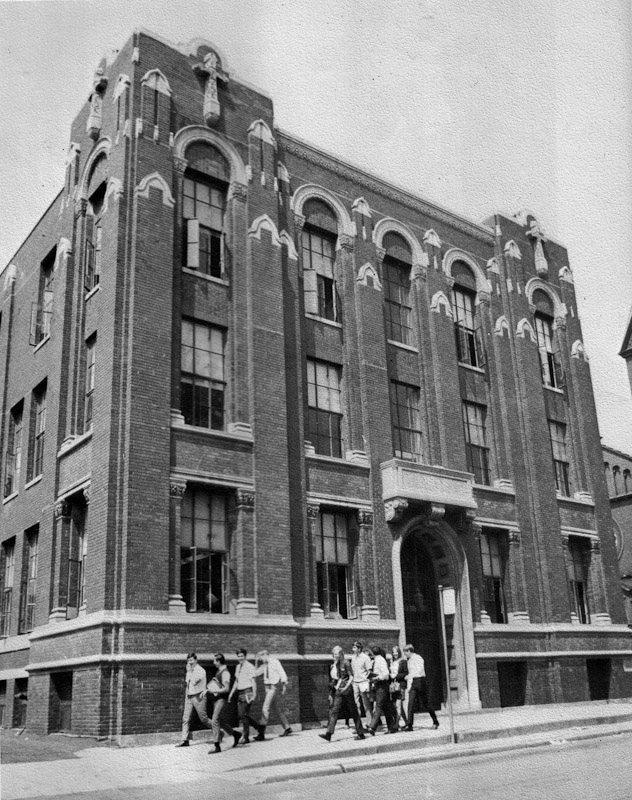 An entirely new high school was built across the street from the church in 1923 and 1926. 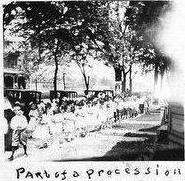 By 1927 there were 1,163 students enrolled in grade school, and 286 in the high school. Though the Second World War brought Germany directly into conflict with America again in the 1940’s, the German parish stayed firmly on the side of the Allies, raising money to support the war effort. “In conjunction with the Fourth War Loan, grade and high school students entered the “Buy-a-plane” campaign. The goal set was $15,000, but the students subscribed $28,000; besides the PT-19B Fairchild, they purchased three field ambulances, four motor scooters, six life boats, ten parachutes, and two water tank trucks.” 700 men from St. Anthony served on the American side throughout the war; 34 of them would pay the ultimate price. Even before the war the notion of an “ethnic” neighborhood was fading; Germans had integrated with the rest of the city, and neighborhoods became more diverse. Though the number of families attending the church started to drop, St. Anthony was still a very strong presence in the community. 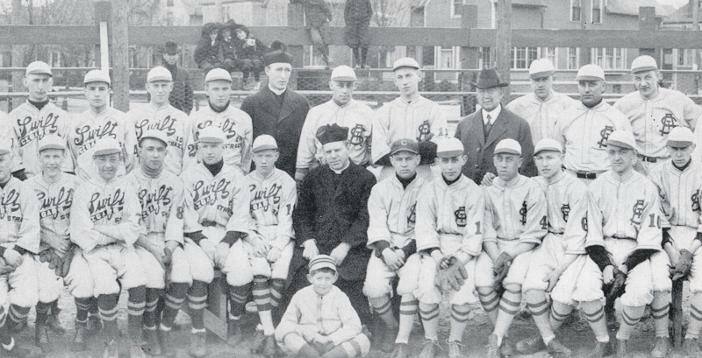 The parish schools’ athletic teams dominated the local sports scene, and remained an academic powerhouse up until its final days. A new basketball gymnasium was added in 1956. Parish history notes, “A most unusual departure is Fr. Raible’s allowing the gym to be used for roller skating,” which was quite popular at the time, though apparently not with the elders of the church. As the number of Catholic schools throughout the city started to shrink, St. Anthony High absorbed several other schools and was renamed East Catholic High School in 1969. By this time, the neighborhood around St. Anthony had gone into decline, and in the 1980’s the Detroit Archdiocese was considering shuttering either the school or the church. The school closed first, in 2005, and the church followed soon after, closing in 2006. St. Anthony merged with another struggling church, Annunciation/Our Lady of Sorrows to form a new parish named Good Shepard Catholic Church. Both the school and church were vacated and put up for sale. Several other churches including St. Agnes closed around the same time, adding to the substantial glut of church properties on the market in Detroit, where churches often remain vacant for years. 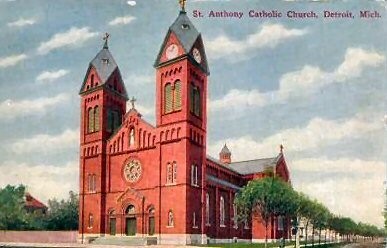 But just a year after closing, St. Anthony had already attracted one potential buyer: Bishop Dr. Karl Rodig, Presiding Bishop of the Ecumenical Catholic Church of Christ. With him and his congregation, St. Anthony entered again a new Era, serving all of God's Children. Constructed of stone and pressed brick in the Romanesque Style, the Cathedral occupies without a doubt, a prominent place among the churches of Detroit. There are three Front entrances. In a niche above the beautiful main entrance stands the large statue of St. Anthony. Upon entering, the first thing that impresses one is the soft, delicate light admitted through beautifully colored stain-glass windows that fill the interior and lends an air of indescribable peace so soothing and inviting to prayer and meditation. Above, the broad wide arches of the ceiling are a sign of firmness, strength and determination. The high-vaulted sanctuary receives its light from four smaller windows of four Evangelists. At the left, a magnificent glass painting of the angelic Aloysius receiving his First Holy Communion from his sainted friend, Charles Borromeo. Under a charming rosette window in the large transept area a triple group: St. Boniface the great Apostle of the Germans, St. Anthony, the patron Saint of the Cathedral, and lastly, St. Vincent de Paul. Moving along we see a splendid representation of the Holy Family. Truly admirable is the scene of our savior among the little children. Next is a picture of the Resurrection of our Lord. The last window shows blessed Margaret Mary Alacoque transfigured by divine love in the vision of the Sacred Heart. On the opposite side is the appointment of St. Peter as Prince of the Apostles. Beside is our savior in the Garden of Olives. Next is a beautiful window depicting the Guardian Angel. Truly a gem of Christian Art is the Annunciation of the Blessed Virgin Mary. In the transept on the left side facing the altar are three windows. In the center is a masterful reproduction of Murillos’s beautiful painting of the Immaculate Conception. Then there are St. Elizabeth and St. Monica, mother of St. Augustine. Above there is a beautiful rosette, similar to the one on the opposite side of the transept. The last window is one of St. Rose of Lima. The nave and transept windows dated 1902 are from Innsbruck, Austria. A rich stream of light floods the entire nave through the rose window over the entrance of the church-the all-seeing eye of God, not an imported window like the others but the product of the Detroit Friedrichs and Wolfrum. The same firm made the windows in the tower. Deserving a notice are the fourteen stations of the cross imported from Germany. 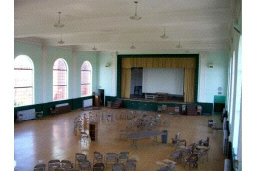 Above the middle entrance door on the interior is a small arched window taken from the Grade School before it was demolished. It depicts St. Anthony holding the Christ Child. The church is Germanic in character, noted in the brickwork and the four-gabled arrangement of its towers-called “Lombard arcading” along with the similar treatment of the roof surfaces. It was demolished in the Spring of 2012. As the last wall came down, among many onlookers, and in its memory, Bishop Dr. Karl Rodig rang the Church bells 86 times for each year the school was standing. We remember the thousands of students who attended this great School. We have built A Memorial on the Church grounds. Ordinarily it is the church that draws parents to the school, but in the case of St. Anthony, the opposite occurred. 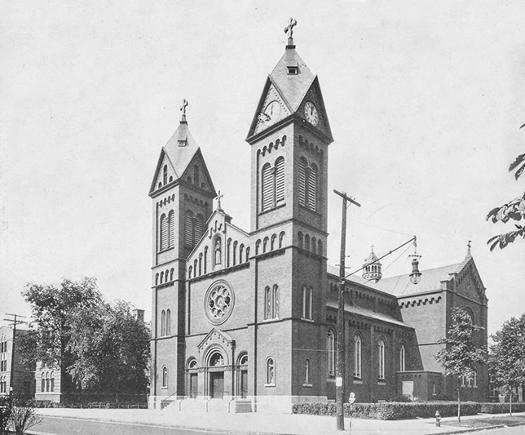 The church was founded in 1850s to serve the growing German population of the east side, and quickly became one of the premier churches in the city. 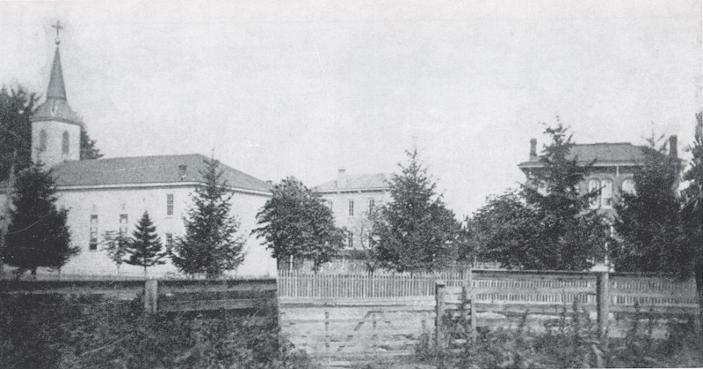 A small school had been constructed in 1865 near the church, but had relatively few pupils. A second school was built in 1882, with a newer, larger school constructed in 1896. 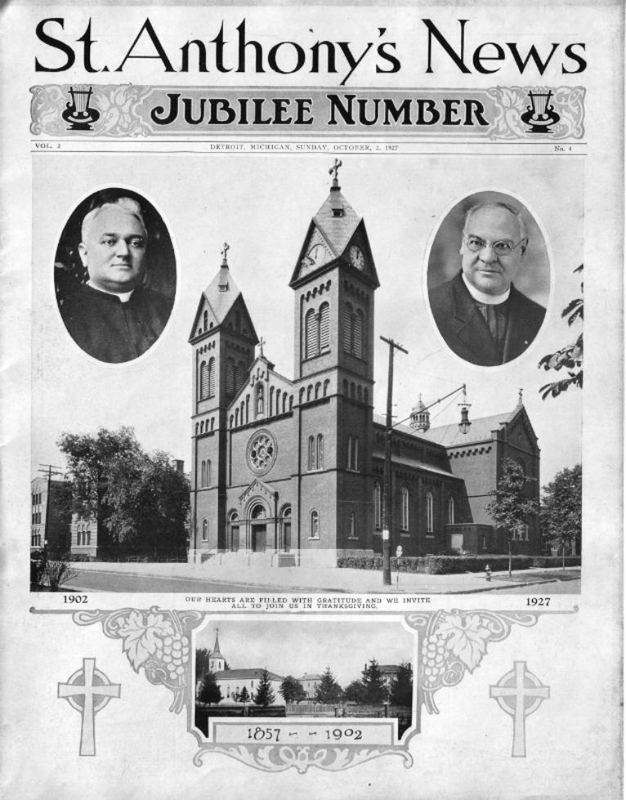 As student enrollment climbed so did the number of regular parishioners, necessitating construction of a newer, larger church in 1901, the year of the Jubilee. 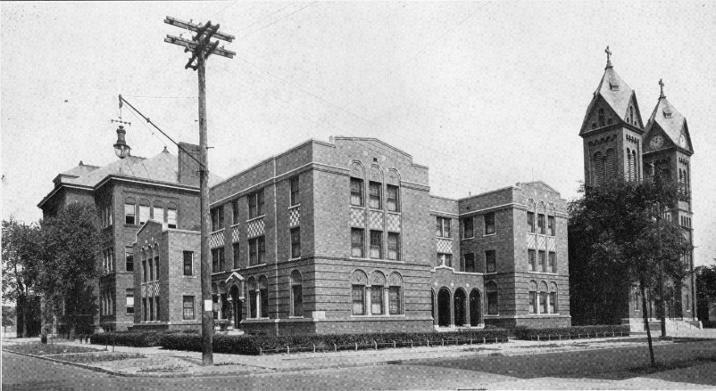 The first high school was built in 1918 on the corner of Field and Frederick streets. This too was quickly outgrown, and in 1925 the auditorium was built across the street. 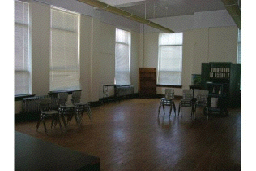 Classes were held in the basement and first floor levels, with the second floor having a large auditorium and stage. The main high school was built in 1926, featuring 13 classrooms, laboratories, and a large study hall. 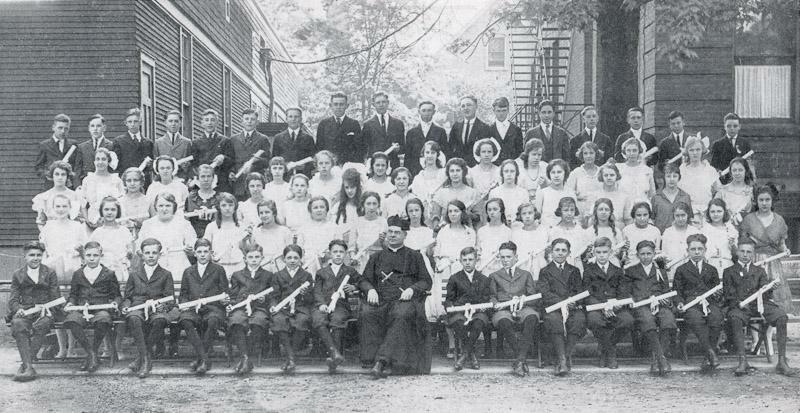 At its peak in 1927, over 1,040 students were enrolled at St. Anthony schools. 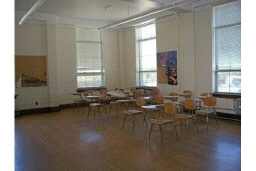 At some point the study hall in the basement of the school was converted into a cafeteria, and a new gymnasium was built next door. St. Anthony continued to be a highly respected school in both academics and sports. 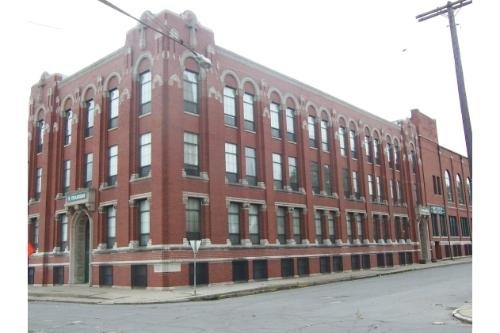 In 1968 it became the first Catholic school in Detroit with a program that worked with computer punch cards. Following a series of consolidations of Catholic schools, several were merged into St. Anthony to form East Catholic High school in 1969. Through the 70’s, 80’s and 90’s East Catholic continued to dominate the local sports scene, particularly in basketball, where they netted eight district titles. The school also managed to maintain a high academic standard despite funding problems and a neighborhood that was in a sharp decline. A 1991 article in the New York Times titled "Where Children Learn How to Learn: Inner-City Pupils in Catholic Schools" described in detail how parents were removing their children from public schools to take advantage of the opportunities at East Catholic: "Cay Gosa worried that her son Cortez was hanging out with the wrong crowd in public school. Robert Cox Jr. was shocked to discover that the public school had placed his daughter Angela in vocational programs. And Verna Colbert was afraid to send her daughter Cherrie to a school rife, she said, with guns and drugs." "They chose East Catholic High, a school so short of money that its principals have saved seven years in vain to afford a school bus, a school with walls painted a depressing shade of institutional green and a tiny cafeteria. It offers far fewer courses and extracurricular activities than public schools. But what draws the parents is the school's record of academic success: 75 percent to 95 percent of the students in any given year go on to some form of post secondary education." On the 1st. Advent of 2010 St. Anthony re-opened with a new congregation of the Ecumenical Catholic Church of Christ, saving what was arguably one of the finest churches in the city. In early spring of 2011 the building became open to trespass. St. Anthony church contacted the Archdiocese on several occasions to let them know the building was being broken into, but after several years of maintaining, it appeared that they had given up on the school. In a few short weeks many of the windowpanes had been smashed out and the aluminum frames ripped from the walls. The rapid decline of the building was very noticeable from Gratiot Avenue, leading people to wonder what had happened. In spring of 2012, the school was finally demolished.